Teishoku is a term that translate to traditional Japanese set meal. It is, btw, pronounced as "tey-show-koo." In Japan it is commonly served in local eateries and family restaurants. Eating a meal composed of many small dishes is very much like Japanese home cooking, so teishoku dining can be seen as the Japanese equivalent of getting a quick home-style meal away from home. It’s a healthy, convenient, and affordable meal option for people of all demographics, from families with small children to office workers. 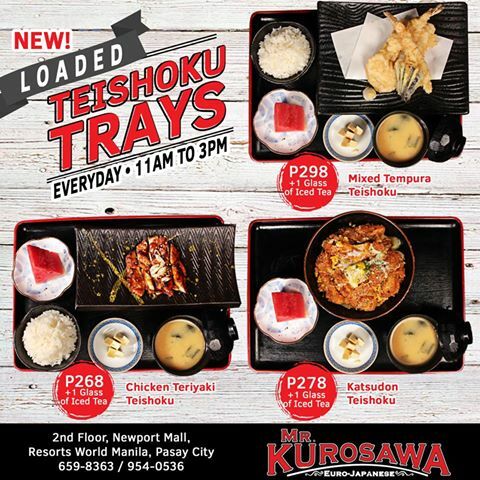 At Mr. Kurosawa, our family were able to try the three kinds of teishoku plus every set comes with a choice of house specialty iced tea. These different colored iced tea, are house-blend and infused with different flavors. You can choose from red, blue and green. The staff were all accommodating and cheerful that night, probably they also enjoyed the day of Halloween Kids Fair which happened just outside their restaurant. The three varieties were Chicken Teriyaki Teishoku, Mixed Tempura and Katsudon Teishoku. ASide from the iced tea, each set comes with a fruit slice, sweet Tamago, miso soup, rice and the main dish. Once your order had been placed, and your drinks served, you will be served with the sides, then with the miso soup. I love their miso soup. It has that right amount of brininess to it. Ours had a lot of wakame or seaweeds and silken tofu. Perfect to start of a heavy meal with the meat dishes we ordered. I need to be truly honest in sharing which technique is best for preparing a really good chicken teriyaki. I did share once how I do my Chicken Teriyaki at home. Many cher would agree that originally it has to be the grilled preparation that involved brining, grilling and basting the chicken, and while delicious, it's a fair amount of work. I can tell that this was how they do Chicken Teriyaki and it turned out to be delightful, smoky and tender to the bite. I can't tell any difference really with the other restos that serve the same dish. These light and crisp mix of tempura gave quite an enjoyment to my daughter, though Dana could be happier if there was another prawn. Notice that the batter is thicker than the usual tempura's in other restos? Another thing, this could be really a top-notch dish if is was served with a good tempura sauce. My daughters' didn't come with any...Saddening. So we asked a soy sauce instead. The third variety, was my husband's. The bowl was really big, compared to the two other dishes, where the rice were serve on separate bowls, his' was a rice topping. The crisply-coated pork cutlet, big as a bowl, is topped on rice and both the pork katsu and the rice were drenched with a delicate and light sauce. With the caramelized onions and bits of scrambled eggs strewn around adding texture and divine flavor to the comforting bowl, which my husband and I shared happily. Both my husband and our 18 year-old Danie had the same order. We came from a heavy coffee afternoon break so I didn't bother ordering for myself. However, the miso soup of my husband was mine! Honestly, I didn't find the mix of Euro-Japanese in their resto's interior design, alluring. The inside was all too red for me. However, I eyed on the glass door and windows with hexagonal trimmings. The idea of putting the artworks on the ceiling doesn't make sense. they were however, good conversational pieces, but it didn't spark interest on my kids, had they only asked. My husband didn't even notice them, as he was observing other diners and the staff adorned in their Halloween costumes. All in all, we did enjoy the teishokus, not so much the whole restaurant ambiance, I guess not for my kids. Their teishokus are very affordable and really filling, too filling me actually. So, catch it at Resorts World Manila, while you still can.